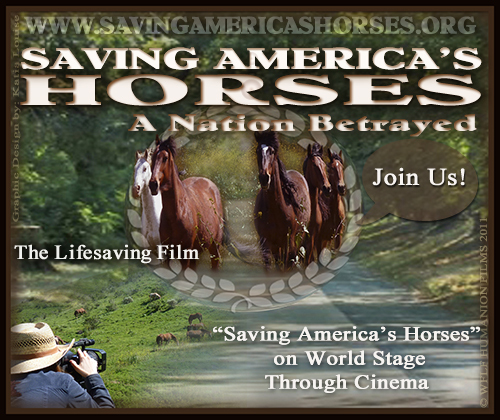 Special Private Advance screening of “Saving America’s Horses – A Nation Betrayed” in Alexandria Virginia,Canadian premiere scheduled to take place on Saturday, September 24th in Huntsville, Ontario. THE FIGHT TO SAVE AMERICAN HORSES CONTINUES. BLOGGER COMMENTS: This is an extremely important project, one that continues the fight to save America’s horses. Please show your support. Thank you. Wild for Life Foundation (WFLF) is pleased to announce the special private advance screening of “Saving America’s Horses – A Nation Betrayed” at the upcoming International Equine Welfare Conference in Arlington Virginia. Filmmaker Katia Louise will present the film in person on Monday, September 26th to registered participants of the conference. Many cast members will also be in attendance for this special screening including Senator Mary Landrieu, former mayor Paula Bacon, Julie Caramante, Craig Downer, JoAnne Normile, Sonja Meadows, Susan Wagner, Laura Allen, John Holland, Senator Dave Wanzenried, Ginger Kathrens and more. “Saving America’s Horses – A Nation Betrayed” is a platform to over 40 of the world’s most renowned equine professionals bringing their voices to the world stage through cinema on behalf of ending equine cruelty. The special private conference screening will follow the screen’s Canadian premiere scheduled to take place on Saturday, September 24th in Huntsville, Ontario. Filmmaker Katia Louise has been invited to present the film in Canada as part of the upcoming International Film North Festival with a filmmaker Q & A to follow. Representatives from the CHDC including Twyla Francois and Shelley Grainger will also take part in the lively discussion. CHDC founder, Sinikka Crosland underscores the importance of bringing this film from the U.S. to Canada because the problems exist on both sides of the federal border. Plans are underway to distribute this film publicly across America, Canada and Europe and beyond, but finishing funds are needed to pay for expense including special processing, screening fees, film rating, theater space, replication and promotion. The special edition “Saving America’s Horses – A Nation Betrayed” film posters are being made a available on a limited basis to help launch this exciting final phase of production. Join WFLF’s “Saving America’s Horses” and receive a complimentary special limited edition “Saving America’s Horses” film poster commemorating the recent screening at the historic Grauman’s Egyptian Theatre in Hollywood, CA. (while supplies last) Donations can also be made in any amount online and by mail. Please help save and protect these majestic animals by making a tax deductible donation today.